Sat., Oct. 22, 2016, 5:42 p.m.
CLEVELAND – Born in November, Francisco Lindor is an October baby this year. You’d never know these are his first steps on baseball’s pressure-packed postseason stage. Cleveland’s dazzling shortstop, who can illuminate a ballpark with his swing or smile, has spent the past few weeks showcasing his talents while helping the Indians get to their first World Series since 1997. And at 22, Lindor is just getting started. He’s on a trajectory to become one of baseball’s biggest stars. “He’s a pretty special kid,” said Indians manager Terry Francona, who never misses a chance to gush about the kid they call Frankie. 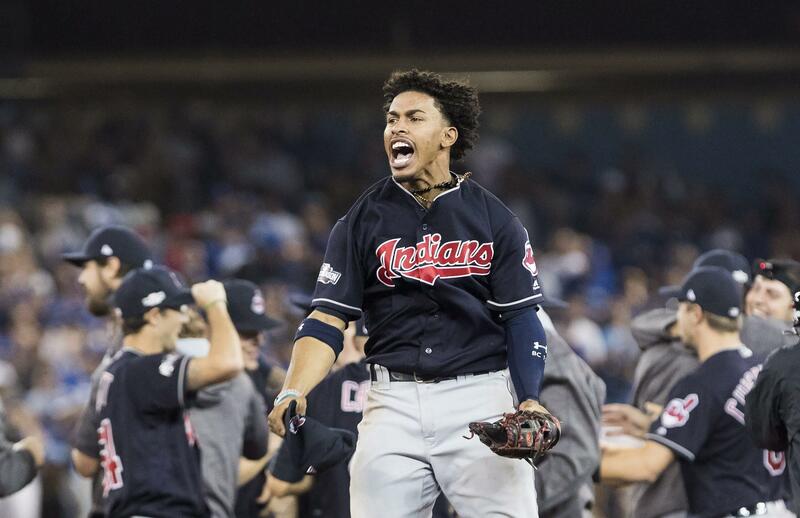 Following a regular season in which he batted .301, hit 15 homers and drove in 78 runs, led the AL in sacrifice flies and made stunning defensive plays that drew comparisons to former Indians Gold Glove wizard Omar Vizquel, Lindor has delivered clutch hits and defensive gems throughout the playoffs – while wearing cleats with “Believeland” written on the sides over a sketched Cleveland skyline. He’s batting .323 for the Indians, who are 7-1 in the postseason after sweeping Boston and taking out Toronto in five games. Lindor’s two-run homer in a 2-0 win in Game 1 of the AL Championship Series set the tone against the Blue Jays, and he finished the series with three multi-hit games, becoming the youngest player since Derek Jeter in 1996 to have that many. Lindor has also teamed up with second baseman Jason Kipnis to turn several crucial double plays to stymie rallies. And he’s doing it all with a refreshing, child-like exuberance that makes him easy to root for. The native of Puerto Rico who moved to Florida when he was a kid plays with an infectious passion. He’s the consummate teammate, eager to give a hug or high five at a moment’s notice. But perhaps most impressively, there doesn’t seem to be anything that fazes Lindor. Lindor is part past, part future. He’s got his own baseball fashion sense, pulling his stirrups high like all major leaguers did years ago to reveal speckled sanitary socks underneath. Lindor, named an All-Star in his first full major league season, usually wears two beaded necklaces over his No. 12 jersey and always a crucifix. His game is 21st century, a blend of power, speed and electricity. Lindor has displayed more power than expected while filling the No. 3 spot in Cleveland’s batting order when Michael Brantley was shelved with a shoulder injury. In the field, Lindor has awed with deep stops in the hole and he has saved runs with diving stabs up the middle. Last week, Lindor spent time in Toronto with Hall of Famer Cal Ripken and former Phillies shortstop Jimmy Rollins, who interviewed him for a TV package. A student of the nuances that make baseball special, Lindor swapped secrets with the pair and was stunned by the 6-foot-4 Ripken’s size. “I looked at him and I’m like, `Wow, what am I doing at short?” he said modestly. When the Indians won their last World Series in 1948, they were led by a shortstop, who also happened to be their manager – Lou Boudreau. And while Lindor doesn’t worry about the rotation or lineup, he’s helping Francona keep the Indians, who have overcome obstacles all season, grounded and focused on their next hurdle. They’ve been dismissed all season. Lindor’s vision could happen quicker than even he imagined. Published: Oct. 22, 2016, 5:42 p.m.